Alpine SWR-10D2 10" Dual 2-Ohm Type-R Car Subwoofer New One Unit (SWR10D2)! RMS Power: 900 Watts, Fs: 41.8 Hz. 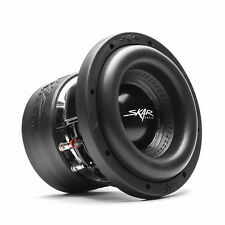 Skar Audio ZVX-8 D2 - 8" SPL Car Subwoofer. Skar Audio. © 2019 Skar Audio, LLC. About skar audio. RMS Power: 900 Watts. It is important to us that if you see our products being used in the lanes, that you have access to obtaining those products. Every component used in the design of these woofers is of the highest quality for reliability and increased performance. Skar Audio DDX-10 D4 10" 1500 Watt Max Power Dual 4 Ohm Car Subwoofer. Skar Audio DDX-10 D4 - 10" Component Car Subwoofer. RMS Power Handling: 1100 watts. Impedance: 4 ohm. PEAK Power Handling: 2200 watts. Mounting Depth:7.875". Powdered black steel basket. Alpine Type-R SWR-12D4 (Free Upgrade to New Model - R-W12D4). 3000W Peak (1000W RMS) 12" Type-R Series Dual 4-Ohm Car Subwoofer. 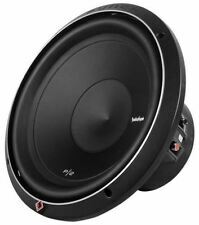 12" Fifth-Generation Type-R Series Car Subwoofer. Every subwoofer needs a subwoofer box. Carpeted, trapezoidal prism enclosure shape for nonslip, durable & scratch-resistant surface. Can be installed in multiple locations. Impedance: 4 ohms. Variable bass boost (0dB–12dB, 40Hz–100Hz). L@@K!!! INCLUDES FULL WIRE INSTALLATION KIT !!! Orion HCCA152. This 15" subwoofer is designed with an improved voice coil cooling system allowing you to enjoy your music for a longer duration. This subwoofer has a 2500 Watts RMS and 10,000 Watts max music power. High Temperature 3" Voice Coils/Direct Leads/2000w RMS! Proprietary woofer optimized by Rockford Fosgate for this enclosure. Rockford Fosgate Sealed Enclosure. 12" Punch Series Subwoofer. "Closed-loop" design ensures optimum performance between woofer, amplifier and enclosure. The SDR series features a 2.5” high temperature 4-layer high temperature copper voice coil that is attached to our Skar Audio signature red spider. The surround on the SDR series is a high roll foam surround which allows the woofer to produce riveting low end bass response. The Skar Audio EVL-12 D2 12" dual 2-ohm subwoofer redefines the conception of low-end sound reproduction. The engineering that went into developing the EVL series is simply amazing, and it shows in the sound quality and performance that this subwoofer demonstrates. This woofer was engineered to sound great and handle ample amounts of power all while maintaining a shallow foot print, which allows them to be very versatile in use. The VD series make for a great under seat subwoofer or for use in applications where mounting depth is limited. Skar Audio VD-12 D2 12" 800W Max Power Dual 2 Ohm Shallow Mount Car Subwoofer. This woofer was engineered to sound great and handle ample amounts of power all while maintaining a shallow foot print, which allows them to be very versatile in use. Rare 12 Inch DVC Dual 4 Ohms Titanium Eclipse subwoofer SW9122. Condition is Used. Shipped with USPS Priority Mail. The SA line was designed to be the centerpiece of the Sundown Audio sub woofer lineup -- the line to which all of their other lines are compared. At Sundown Audio this still was not enough so they designed a highly optimized voice coil cooling system that ensures that an SA series woofer will never over-heat when used anywhere close to it's rated power level. 1400W Peak Power. These small but powerful subwoofers feature DVVC (Direct Vent Voice Coil) cooling technology rapidly dissipating heat allowing MOJO Mini subwoofers to play louder and longer. 4-layer copper 1.5" voice coil. Rare old school SQ sub from early 90's. Looks and works great! The Skar Audio EVL-12 D4 12" dual 4-ohm subwoofer redefines the conception of low-end sound reproduction. The engineering that went into developing the EVL series is simply amazing, and it shows in the sound quality and performance that this subwoofer demonstrates. DS18 ELITE Z SUBWOOFERS (unboxing) - YouTube. DS18 Marine Audio Logic PRV Timpano Massive Audio. 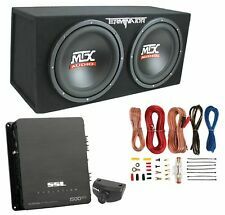 10" Shallow Mount Subwoofer 1000W 4 Ohm Pro Audio Bass Speaker DS18 SW10S4. 2x 6 Foot Dual RCA To AUX Cable High Quality OFC Noise rejection Cable DS18. Every component used in the design of these woofers is of the highest quality for reliability and increased performance. Skar Audio DDX-12 D2 12" 1500 Watt Max Power Dual 2 Ohm Car Subwoofer. Skar Audio DDX-12 D2 - 12" Component Car Subwoofer. Whether you are looking to be the loudest vehicle at a car show, or just wanting to enjoy the bass in your daily driver at unprecedented sound levels, the VXF series is the unequivocal choice. Skar Audio VXF-12 D2 - 12" Component Car Subwoofer. Every component used in the design of these woofers is of the highest quality for reliability and increased performance. Skar Audio DDX-10 D2 10" 1500 Watt Max Power Dual 2 Ohm Car Subwoofer. Skar Audio DDX-10 D2 - 10" Component Car Subwoofer. This 12" shallow subwoofer handles 1,500 watts max., 400 watts nominal power (RMS), and delivers deep bass with top-notch sound quality thanks to features like Pioneer's MICA injection-molded resin which gives it the ability to produce accurate bass. Oversized Cone Surface The TS-SW3002S4 utilizes an oversized cone structure that provides greater cone and gasket surface without changing its standard external dimension. This cone surface allows the subwoofer to produce louder and deeper bass by moving more air. Reinforced Cone Structure The cone structure of this subwoofer uses a highly rigid cone made with MICA injected molded resin which creates a rigid and durable cone, giving it the ability to produce accurate bass. Alpine Type-R SWR-10D2. 3000W Peak 10" Type-R Series Dual 2-Ohm High Performance Subwoofer. 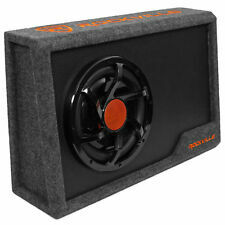 10" Dual 2-Ohm Type-R Series Car Subwoofer. Alpine KTE-10G. Every subwoofer needs a subwoofer box. Check out our selection and get a box that'll make your woofer bump its best! 4 out of 5 stars - Alpine Type-R SWR-10D2 3000 Watt 10" inch Dual 2-Ohm Car Audio Subwoofer Sub! 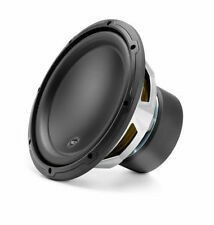 10 product ratings10 product ratings - Alpine Type-R SWR-10D2 3000 Watt 10" inch Dual 2-Ohm Car Audio Subwoofer Sub! 8" Dual 4 ohm Summo Series Subwoofer. 1x Cadence Q1T/CST1 1" High Performance Piezo Tweeter Surface Mount Only 100W. DS18 Marine Audio Logic PRV Timpano Massive Audio. 10" Shallow Mount Subwoofer 1000W 4 Ohm Pro Audio Bass Speaker DS18 SW10S4. 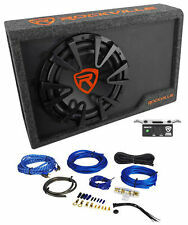 ROCKFORD FOSGATE R2SD4-10 400W 10" Dual 4 ohm Car Subwoofer + Sealed Enclosure! When you're looking to swap out your vehicle's original sound system for an aftermarket set of speakers, you'll need woofers and subwoofers to produce the bass. You can pick and choose from many brands, models, and sets of specifications. When you're ready to change the sound of your music, you can narrow down your options and decide which subwoofer is optimal for your desired bass. What types of subwoofers are available? Enclosed non-powered - This passive bass subwoofer has the protection of an enclosure and will need an amplifier. Enclosed powered - No additional amplifier is necessary to use this protected subwoofer as it has internal amplification. Non-enclosed non-powered - These passive car subwoofers without enclosures will need external amplifiers. Non-enclosed powered - No external amplifier is necessary for this item, but make sure you keep it safe from dust, dirt, and liquids. What different audio voice coils are there? Single - The single voice coil will have a single wire wrapped around the cylinder, with one positive terminal and one negative. The single audio coil has only one ohm option, which is the one listed. Dual - Dual audio coils have two wires wrapped around the cylinder and two of each terminal. This allows you to adjust the ohms slightly to be wired to match your amplifier. Quad - The quad audio voice coils have four wires and four of each terminal. They can significantly adjust the produced ohms to match the amplifier. How do you determine the correct RMS power? 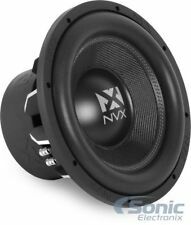 An important option to consider when picking a car subwoofer is the desired RMS, or average output. Since your car's audio system can't handle the peak bass spikes on a regular basis, you need to know how much sound it can handle regularly. Voltage - Using a voltmeter, find the voltage of the subwoofer or other speaker. Amperage - A multimeter will give you the ability to find the amperage released by the component. Average output - Multiply the voltage and the amperage to determine the average output. This number will determine if the sound system will work for your needs. Which subwoofer size will fit in a sedan? If you have a compact or other type of economy car, the most room you will have is for 8-inch and 10-inch subwoofers that will be able to produce a solid bass. Ten-inch car subwoofers are commonly used in vehicles that play significant amounts of rock and country music.